This looks more like an optical illusion object than an actual puzzle. 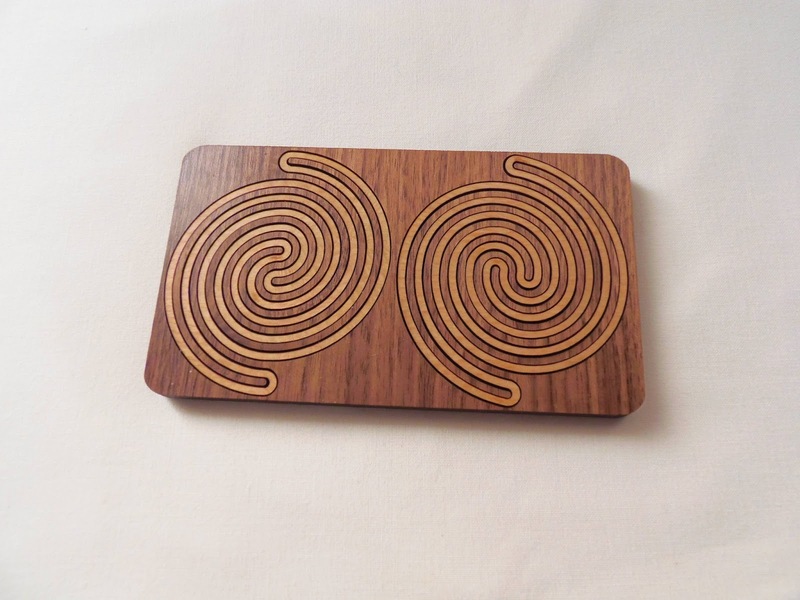 The mesmerizing pattern created by these two loops almost gives a sense of movement. Its designer is none other than Jean Claude Constantin. 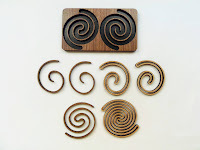 The 2 Loops is actually a Packing Puzzle with six pieces. Simply remove the pieces from the tray and pack them up again. It's deceptively easy, considering the complexity of the two shapes. 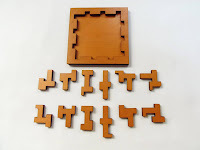 The puzzle is made from two contrasting wood tones, which gives an impression that only the lighter parts can be removed and the others are part of the frame. 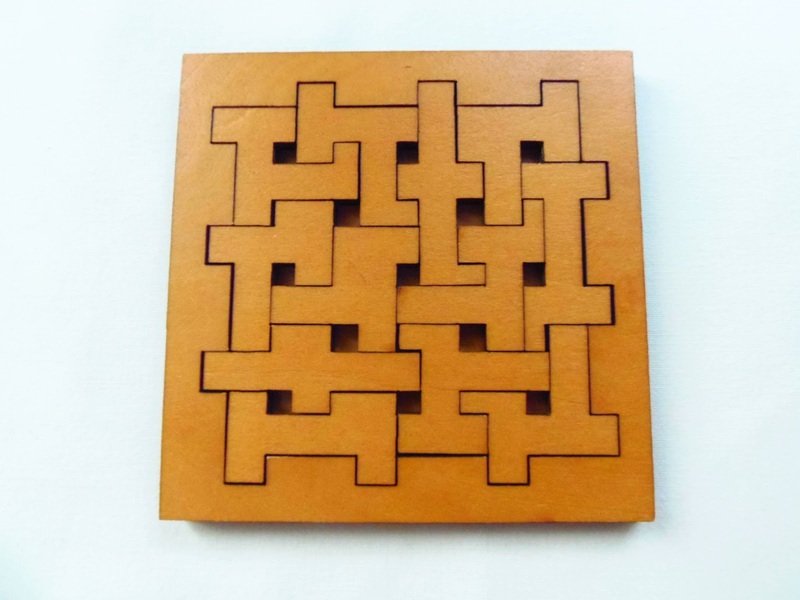 This is a relatively small puzzle, measuring only 14.2 x 8cm (5.6" x 3.2"). For a puzzle in the $15 price range, its quality is superb. The top of the frame is polished and the loops fit perfectly inside the tray. I was really surprised by how springy the pieces are once you remove them from the tray. It has quite a remarkable design. Before attempting to solve the 2 Loops I was a bit intimidated to remove the pieces, because this was classified as a level 8/10. I was counting on spending some time wondering how to solve it, but as it turns out, it wasn't even remotely challenging. What a disappointment... After solving it twice, to make sure it wasn't just plain luck, I couldn't think of any reason why this was rated as a level 8. When you remove the pieces, you're still left with the outline of the loops to help you place the pieces more easily. It can't get easier than this. Honestly, I don't think it even deserves a 5, because when you remove the pieces you immediately figure out where each one goes... And yes, I mix them well before solving. If you happen to own one, please let me know what you think of its difficulty. I'm curious to know other opinions. Overall, I don't consider the 2 Loops a bad puzzle. The reason is because I don't think it should even be called a puzzle. The concept is visually captivating and I loved it, but it's nothing more than a decorative object. I would recommend this one only for collectors. If you you're looking for a challenge, find something else. Availability: You can get a copy of the 2 Loops at PuzzleMaster for $15 CAD. The Planets puzzle comes from the genius mind of Oskar van Deventer, one of the most prolific puzzle inventors out there, and it’s manufactured by Recent Toys. Planets is a very unique puzzle. Actually, I don’t remember ever seeing anything remotely similar. That shows you how talented Oskar really is. 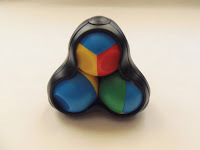 The puzzle is comprised of four identical balls, each one with four different colors as well. 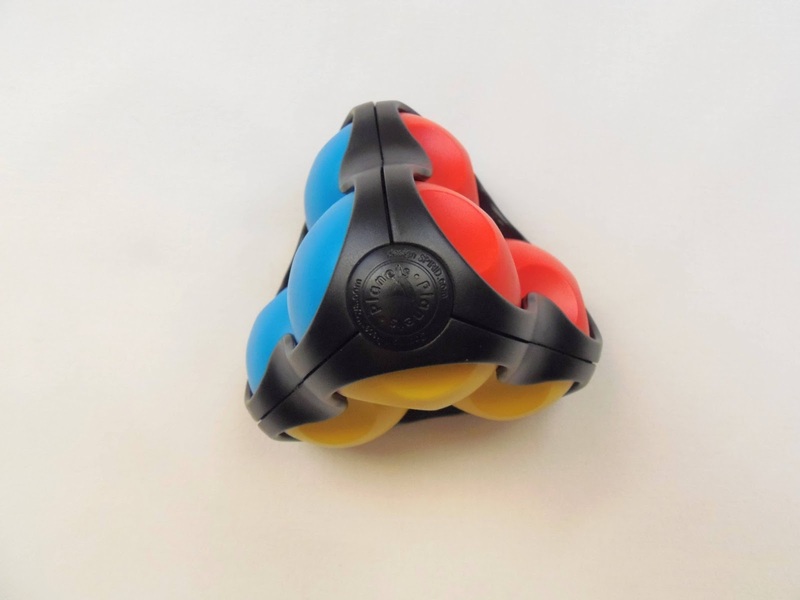 The pyramid shape assures that all four balls are touching each other at all times. The black frame holds the planets tightly in place, so there’s no way you can cheat. What you see immediately as one odd characteristic of the puzzle is that each planet is full of craters, six per planet to be exact. These craters can function as one of two ways: movement blockers, or used to unblock any of the other balls. Because of these craters, the movement of the puzzle is most of the times restrictive. Every move that you attempt to do has to be planned in order to solve the puzzle. To allow a movement, a planet has to nestle on two or three craters from adjacent planets. With this in mind, your goal is to mix the puzzle and have one single color in each of its four faces. So, how difficult is the puzzle to solve? – Well, for me it was quite challenging, actually… And frustrating. 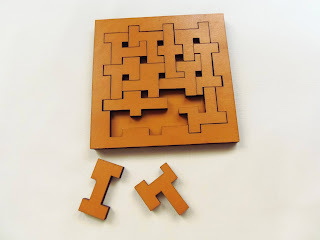 I have had this puzzle for a few years now and, although I made considerable progress on my puzzle solving skills, I remember very well how tough it was to solve. I did solve it, eventually, but it took a while. As I was writing this review, I thought I might as well have another go, to see how I really improved since last time. After having spent almost an hour to solve this fiendish puzzle, I reckon it’s still challenging no matter how good I am. If I were to rate it on a 0 to 10 scale, I would probably classify it as a level 9/10. Availability: You can buy Oskar's Planets at PuzzlesdeIngenio.com. Tilt is yet another gem just like Rush Hour - Addictive and extremely fun to play with. 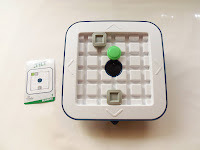 This logic puzzle game was invented by Vesa Timonen and Timo Jokitalo, and it's manufactured by ThinkFun since 2010. The game is brilliantly designed to provide a wonderful experience, like no virtual game can ever achieve. 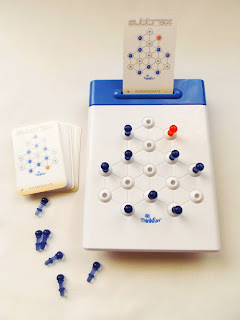 I remember playing something on the computer long ago, with a similar concept, but can't remember its name. What I can say, though, is that I enjoy much more a hands-on approach. Tilt consists of a square grid with a round base. 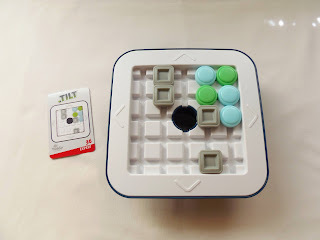 You tilt the board in the four basic directions so the green sliders can drop through the center hole. To make things a bit more complex, you have to worry about the blue sliders and not let them drop in the center hole as well. Square blockers are placed around the grid to get different outcomes. Included in the game are 40 challenge cards with four levels of difficulty. Setting the game to play is very easy: You choose any of the challenge cards (if you're an experienced puzzler, I recommend skipping to the harder levels), and place the corresponding sliders and blockers in place. After solving a challenge remove the sliders from the bottom of the grid and set another one. There's another thing you need to keep in mind when playing: with each move the sliders need to go from one side of the grid to the other. You can't just stop in mid way and change the direction of movement. You'll get used to the play mechanics if you start by the easier levels. The game isn't that hard, actually, even on harder levels. As you progress through the challenges you start seeing more sliders and blockers being used. The number of possible moves also rises, but by that time you're already acquainted with the game's mechanics, and you should solve each level within a few minutes or less. If you get stuck at a particular level, just reset it and try again. It's better than constantly going back and forth. (Click to Enlarge) - Expert Level, Can You Solve It? I absolutely loved Tilt and its ingenious design. My only gripe is that you can breeze through the 40 levels in no time. I would've loved extra challenge cards like they did for Rush Hour. 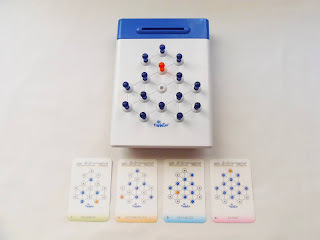 The game is for 1 player only, but since each challenge can be solved rather quickly, it can be easily shared by multiple players taking turns. 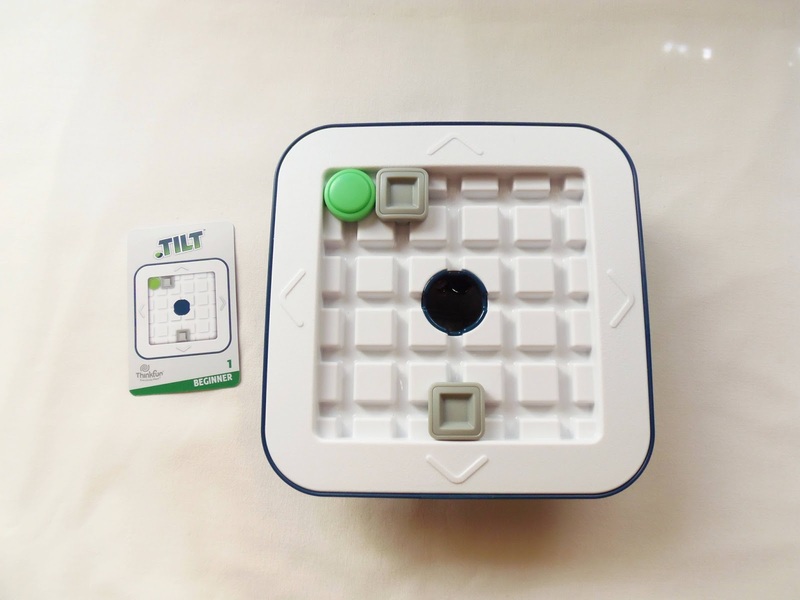 Availability: Tilt is available from Sloyd, in Finland, for about €24. As part of the Deal of the Week, you can get this game with a 15% discount just by mentioning the name of my blog when you place your order. Offer available only until May 3. 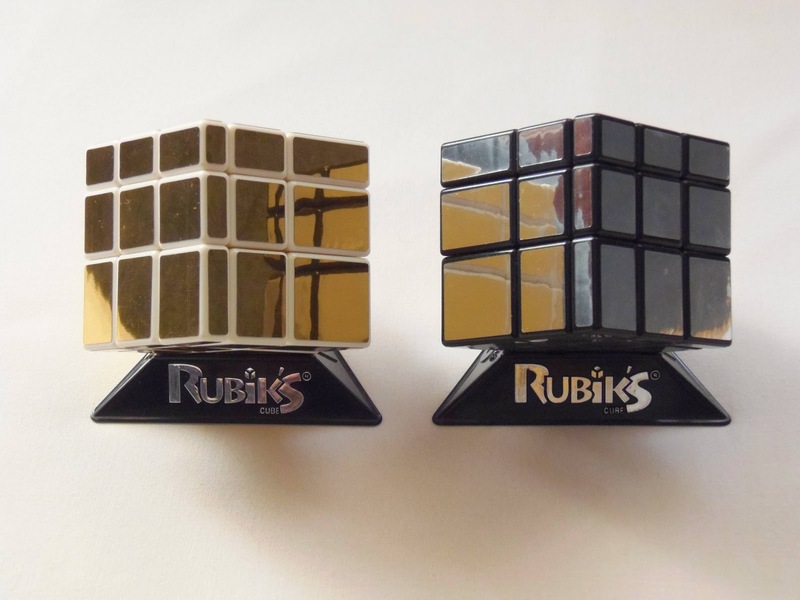 Rubik’s Mirror Blocks was invented by Hidetoshi Takeji in 2008, also known as Bump Cube. Later that year, the puzzle was licensed to Rubik’s and since then is being mass-produced. Based on the classic Rubik’s Cube 3x3x3 mechanism, the puzzle is a fascinating variation, which inspired a whole new breed of “Mirror” puzzles, where you solve by shape instead of color. The Mirror Blocks come in two colors, with silver or golden stickers, giving them a nice mirror effect. The interesting thing about the puzzle is that each of the 27 pieces is different from each other. When scrambling it, this creates countless shapes, because the center pieces are not actually centered. The puzzle is about the same size as a standard Rubik’s Cube, although the movement is a little clunkier and doesn’t have the same build quality as the original. It also feels lighter. At first, the puzzle is very intimidating to solve, because it has only one color. This is good for a color-blind person, since you’re solving it by shape. Once you see it scrambled it’s quite hard to visualize the cubic shape. If you’ve never solved a Rubik’s Cube, I suggest you start by solving one, because the Bump Cube is a step up in difficulty. The solving process is about the same, but since you’re not seeing colors you have to visualize where each piece corresponds. 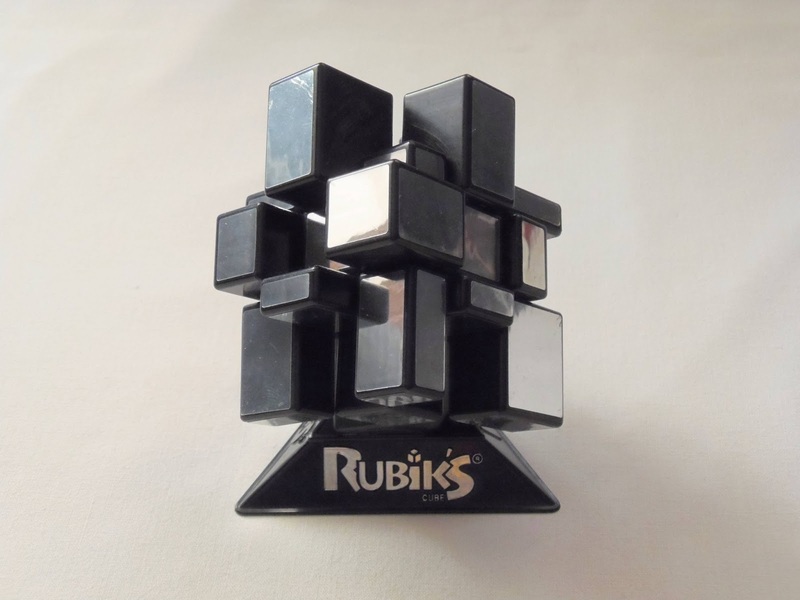 It gets easier as you practice, and in no time you’re going to have similar solving times to the original Rubik’s Cube. The Rubik’s Mirror Blocks are among my favorite puzzles. The design is brilliant and, in my opinion, it’s one of the greatest inventions in Twisty Puzzles since the original Rubik’s Cube. If you don’t have one or two in your collection, what are you waiting for? 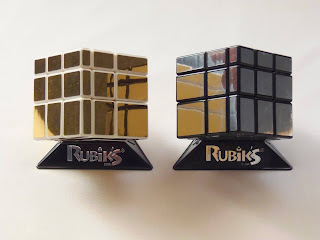 Availability: You can buy the Rubik's Mirror Blocks at PuzzlesdeIngenio.com. 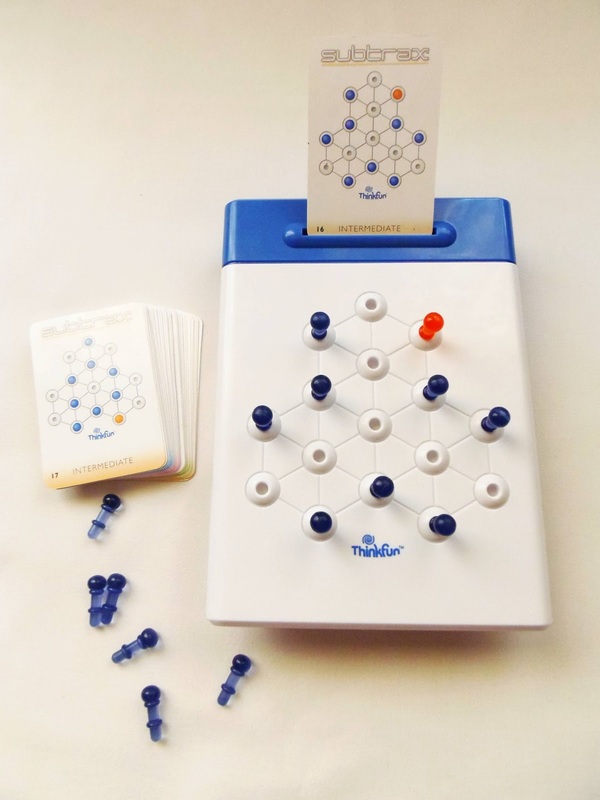 Crossteaser is one of the most interesting puzzles manufactured by Recent Toys. Its colorful appearance is sure to intrigue even the least curious minds. Prepare to be frustrated as well, because this puzzle is very hard to solve. The Crossteaser is comprised of 8 identical crosses, each with six different colors, arranged in a 3x3 grid. There is an empty space which you use to move any adjacent piece into. By holding the puzzle with the “Crossteaser” logo facing you, you move the pieces up and down along the vertical slots, and left and right along the horizontal slots in the backside of the puzzle. The goal of the Crossteaser is to mix the pieces and solve it so that each cross shows one single color in the front and another on the back, also with the side colors in the same orientation. Achieving this is extremely difficult, though, so expect some serious puzzling. The design of the puzzle is very pleasant with a round frame that’s very comfortable to hold in your hands. The transparent frame is also very practical to see where all the colors are situated at all times. In terms of size, the Crossteaser has about 12cm in diameter, which is big enough to manipulate. The pieces make a distinct click sound when you put them into place – Quite a noisy puzzle, though. As hinted above, this puzzle is one hell of a challenge, comparable in difficulty to the Rubik’s Cube. I have tried to solve it on several occasions, but unsuccessfully so far. I have also tried to follow a solution guide, but even that proved to be quite difficult to read. This one has to remain unsolved for a while longer, until I have the patience to put it back to its former glory. Although I have been unable to solve it, I love the Crossteaser, and I’m sure solving it would be extremely rewarding. Playing with it is highly satisfying, due to its pleasant mechanism, and the colorful design is very elegant and attractive. I most certainly recommend it, even if you think you won’t be able to solve it. Availability: You can find the Crossteaser at the Spanish puzzle store PuzzlesdeIngenio.com. In addition to his wide variety of designs, Jean Claude Constantin also makes puzzles of all types and categories. This time, I have one that requires a good amount of dexterity, the Impuls (Inertia). The German word Impuls might be interpreted to English as impulse or momentum, or as the alternate name Inertia. It's a very fitting name, as you'll discover when you try it for yourself. 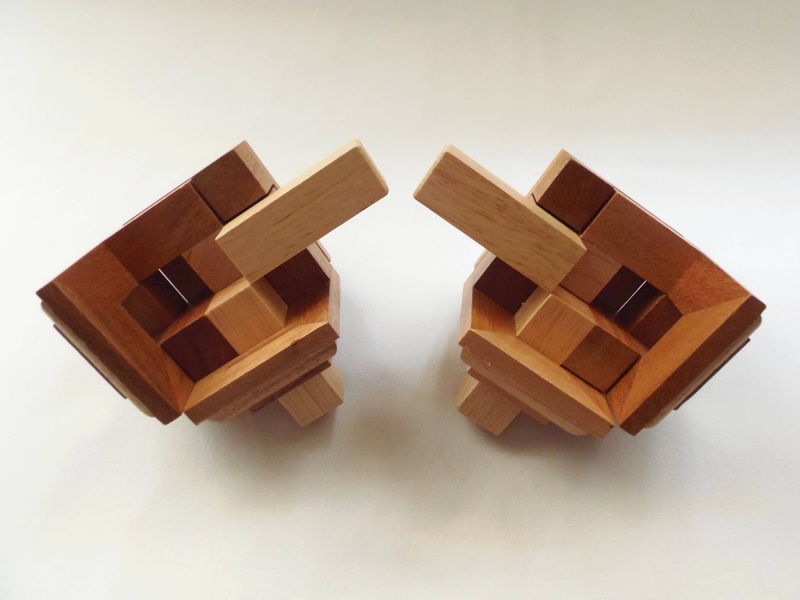 Impuls, like any other Constantin puzzle, has a very elegant and functional design. This is quite a small puzzle, actually, measuring only 6 x 5 x 5cm (2.4" x 2" x 2"). The materials used are a combination of two contrasting wooden tones and an acrylic window that lets you peer inside. What you'll be seeing, though, will be enough to solve it. 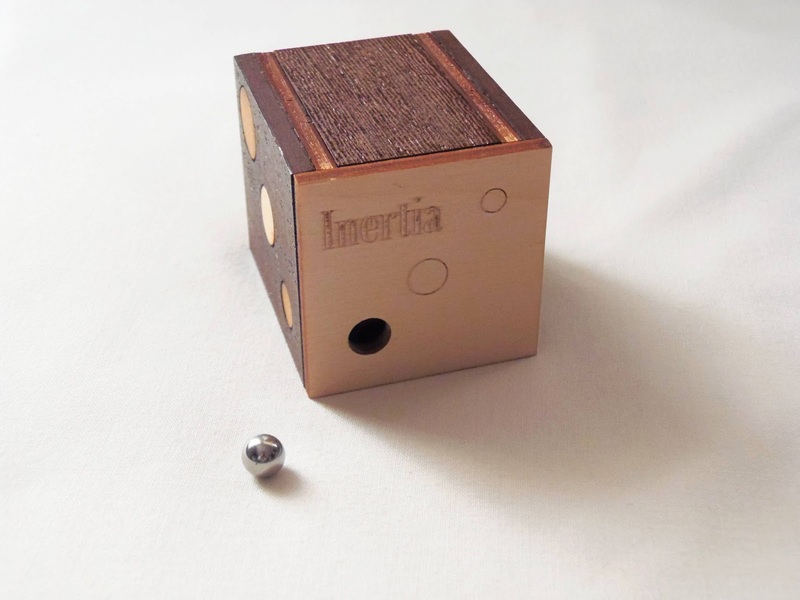 The cube has some sort of inner maze, although it's not your typical maze, which you need to navigate with a small ball bearing and free it. The solution itself has only a couple of moves, however you'll be doing quite a lot of unnecessary ones before you can actually solve it. This is not a difficult puzzle, even if you're not used to dexterity puzzles. PuzzleMaster rates it as a level 7/10, but I would probably rate it as a level 6. Do you remember the classic game of "Ball in a cup"? The solving process of the Impuls is actually very similar to this concept, even though there's a little more to it than just throwing the ball around. There's no string involved, but I think you get the idea. It only took me a few minutes to solve it. Setting the puzzle again is much easier. You just need to place the ball inside and it'll go through to the other side effortlessly. Solution: You can download a solution here. 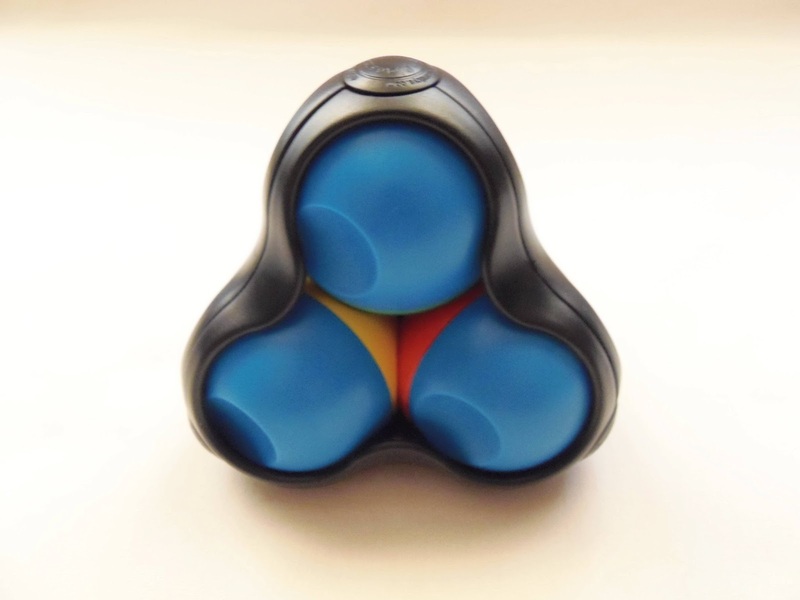 While the Impuls is very easy to solve, it can be rather fun to play with. Everyone, non-puzzlers included, should have a great time with it, and it's a puzzle you can always attempt to solve anytime, just to see if you can solve it faster. Availability: You can buy the Impuls (Inertia) at PuzzleMaster for $19 CAD. You can also browse other designs by Jean Claude Constantin. Zahnradlaby (a.k.a. Double Gear Maze) by Jean Claude Constantin is a superb puzzle that begs for your attention. Reminiscent of those contraptions from the Leonardo da Vinci era, this striking looking puzzle is just as hard as it looks, and some more. 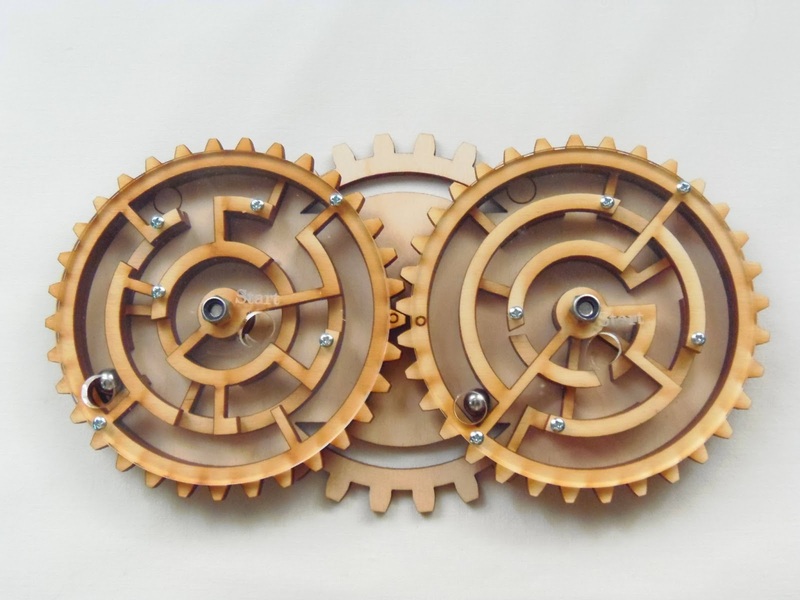 The Double Gear Maze is a variation of another much simpler Constantin design, the Gear Maze. Besides the obvious differences with the two mazes, the Double Gear Maze actually features smaller labyrinths, with three pathways, whereas the Gear Maze features four pathways. Although I haven't tried the simpler design, I reckon it's safe to assume the Zahnradlaby is much harder to solve. The puzzle is made from acrylic to cover the mazes and the rest from wood. The mechanism, as expected from a Constantin puzzle, works very well. 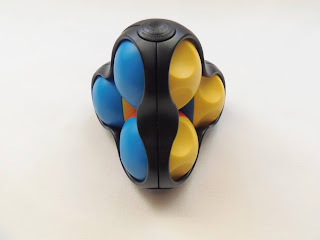 Occasionally, the balls might get jammed under the top maze, but to avoid that just make sure you tilt the puzzle in the direction of the ball's movement. The size of the puzzle is also pretty good, measuring 20cm in diameter (7.9"). 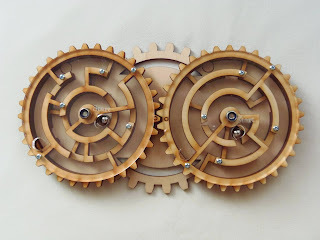 Both gears have two layers with different labyrinths: the bottom one, which is stationary, and the top one, a moving maze which you can rotate back and forth to create a unique path for your ball bearing. By constantly rotating both gears in sync, the goal is to free the two ball bearings at the same time. I see two circle marks in both gears that should be indicating the solved position, but with the gears' positions it's just impossible to get both holes above these marks at the same time... Unless the intention of the designer was to actually solve one at a time. Since you're solving both mazes simultaneously, you have to take into account that every move you do on one maze has an effect on the other one, and vice-versa. 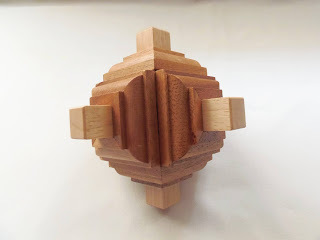 As you'll be constantly hitting dead-ends, you have to figure out where you need to put the ball bearing on one maze so the other ball can proceed. This constant motion of back and forth is quite challenging, because at times you think you're getting closer to the goal with one ball, but the other one requires you to go back. It's a little frustrating, to say the least. I loved the look of the Double Gear Maze. The concept is fantastic and it has the right level of difficulty. I can see why Constantin made these mazes shorter than the Gear Maze, as it would've been a tad too difficult. 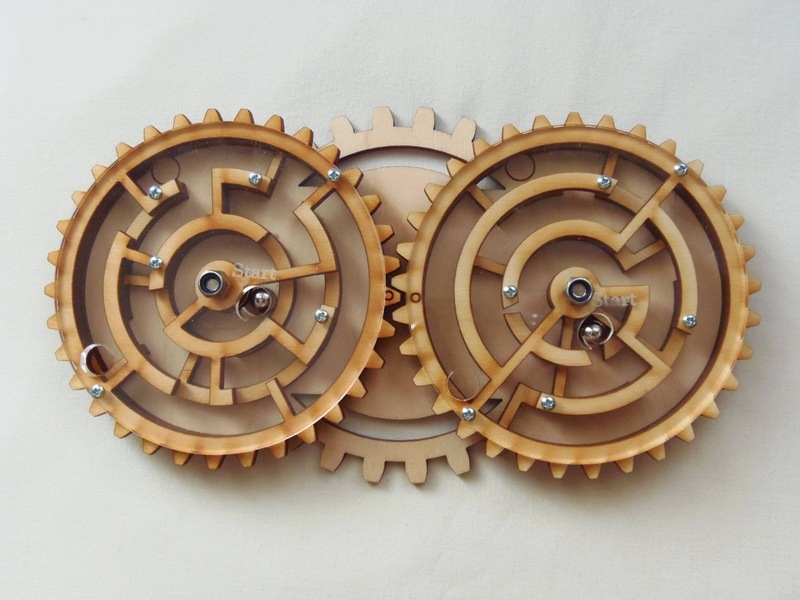 Availability: You can find the Double Gear Maze at Sloyd.fi for about €32. Today, I realized I'm writing the 35th puzzle review from Jean Claude Constantin. That's way more than any other puzzle designer. I still have in my collection several more of his creations that haven't been reviewed yet, which most certainly takes the total number to well over 50. And the sad part is that I don't even have half of his puzzles. 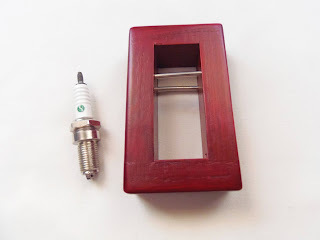 My latest addition is Get Charged, a very original puzzle with a clever hidden mechanism. There are countless puzzles in the hidden mechanism family, and if you're familiar with them this one will be solved in no time, as I've seen this concept in other puzzles. Get Charged is manufactured by Bits and Pieces, which got me positively surprised. As you may know, from some previous reviews, this company isn't famous for their high quality puzzles, but this one is actually pretty decent. 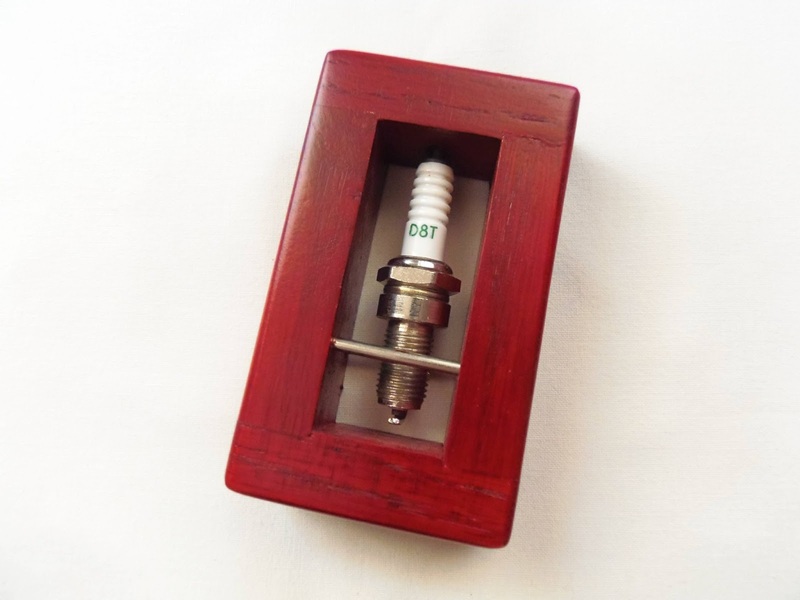 The wood has a gorgeous dark red tone, smooth and unscratched, and considering it uses an actual spark plug, it's in very good condition. 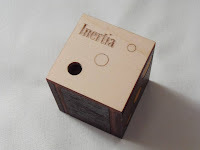 The puzzle is relatively small, only 9.7 x 5.7 x 2.5cm (3.8" x 2.2" x 1"). As far as difficulty goes, it really depends if you have solved any hidden mechanism puzzles in the past. If you have, like I did, then you shouldn't take more than five minutes to crack the secret mechanism. If you didn't, then I believe it will be a tough one. PuzzleMaster has rated it as a level 8/10, and for beginners it's just about right. For experienced puzzlers, though, I reckon it's more like a 6, 7/10 at the most. I don't want to go much into detail about the puzzle's solution, but one thing that I always do with hidden mechanism puzzles is to give them a shake and try to hear loose pieces rattling inside. Not all of them have this type of mechanism, but many do, and this is one of them. 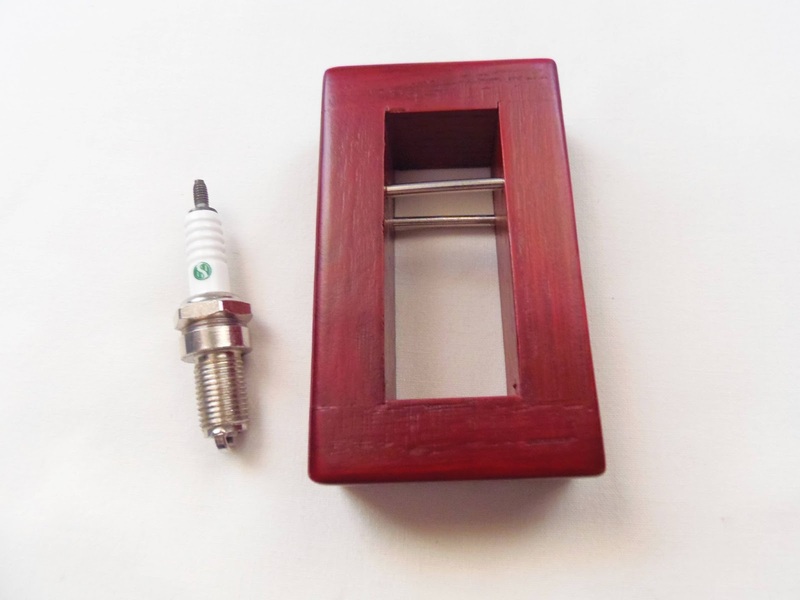 You just have to find a way to remove that little metal rod and free the spark plug. Get Charged doesn't offer much in terms of new concepts. I've seen it implemented in other puzzles too. However, the design, as Constantin has accustomed us with his gems, is a superb and original idea. Kudos to Bits and Pieces too, for a well manufactured puzzle for a change. Availability: You can find the Get Charged at PuzzleMaster for just $15 CAD. For other great Constantin designs, check out their special section. If there's one thing I dread the most in String Puzzles is their natural ability to produce knots out of nothing. Some puzzle are more prone to this than others, and the Quatro puzzle by Eureka is guilty of such crime. The puzzle was designed by the Swedish, Eric Johansson. Quatro, coincidentally or not, is Portuguese for the number four. It's also the highest level of difficulty used by Eureka to rate their puzzles, 4/4. Quatro is comprised of four wooden rings, each with a colored string attached. The intertwined mesh forms a beautiful symmetry, although quite an intimidating one. 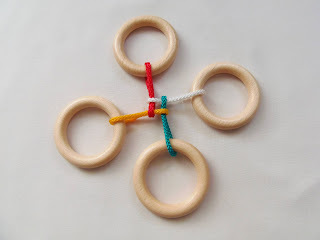 The object is to separate the four rings and put them back together. At first, I wasn't expecting this puzzle to be so stressful to solve. Sure, it's a level 4/4, I assumed it would be challenging, but I didn't know it'd put up such a fight. 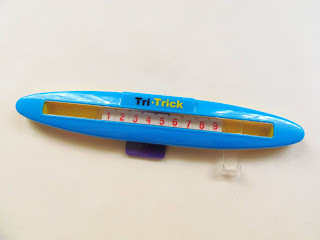 The problem with the puzzle is that the strings are too tight, and when attempting to solve it, the tension in the strings is so big that it almost tears them apart. And the funny thing is that the description on the puzzle says "No force needed". After a couple of unsuccessful tries, before looking at any solution, I suspected my approach wasn't right. I was starting to think that making the string go around the ring wasn't the right move, but how else would the puzzle be solved? I was only seeing that option... Much to my surprise, when I finally caved in and looked for a solution, I found out that it was indeed required for the strings to go around the rings. Determined to solve it, I proceeded with the instructions, but even with the solution in front of me I didn't get far. Also, because the colors used in the solution didn't correspond to the actual colors in my puzzle. Talk about a dead end. I guess I don't need to tell you what's the current look of the puzzle, but I'll still tell you... It's full of knots impossible to untie, unless I cut the strings. This is how the puzzle should like when/if solved. The Quatro puzzle is probably the most fiendish puzzle I ever attempted to solve. 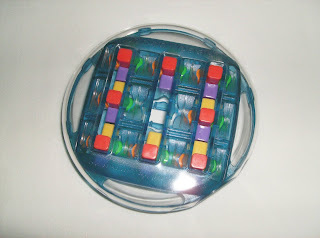 I'm bummed that I wasn't able to solve it, not by any lack of skills, but by the flawed design of it. It should have been built with bigger strings. Still, if you like a really serious challenge, and you have the patience of angels, go for it. 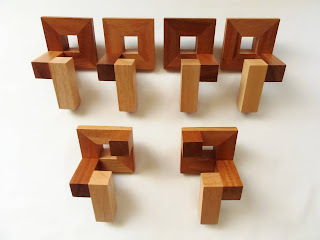 Availability: I received the Quatro puzzle from Sloyd, and you can get one for about €8. The Tri-Trick is a sliding puzzle made by the Hong Kong based company Hidden One Design. The puzzle I have is actually an updated version of an older design, now discontinued, which was available in two colors (black or white) just a few years ago. The new design is, in my opinion, much more attractive, although some puzzlers might disagree with me. Now, it does look more like a toy than an actual puzzle, but the mechanism was left intact, as only the colors have changed. Speaking of colors, the new puzzle is quite colored. I see why the choice of a revamped design, because it does draw more attention. I see blue, yellow, purple, white, red and black. While it seems like an exaggeration, the colors blend very well together. The size is relatively small, with measurements of 17 x 4cm (6.7" x 1.6"). Feels light in the hands, but the mechanism works surprisingly well. 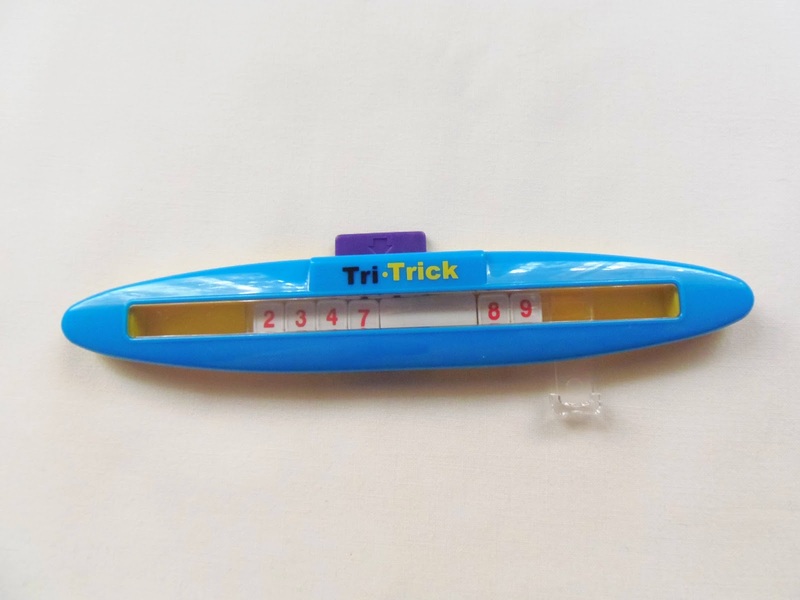 The goal of the Tri-Trick is very simple: from a scrambled arrangement, you have to place all nine digits in sequential order. The puzzle comes in the correct arrangement already, so you have to scramble it first before attempting to solve it. So how does the puzzle work? A slider, containing nine digits from 1 to 9, moves horizontally, and another one is perpendicularly positioned, moving up and down by carrying three adjacent digits at a time. You solve the puzzle by exchanging any group of three tiles with another. This would be too easy, however, if it weren't for the blank tile which has a three-digit length. There are three levels of difficulty. The first level is the easiest, with over 360.000 combinations, and you play with all nine digits. As you get more confident, you can try level 2 by leaving the digit 9 in place and move the other eight only. The third and hardest level, with about 5.000 combinations, uses only seven digits by leaving the 9 and 8 in place. I can only imagine, for now, how difficult the other levels must be, since I've spent more than half an hour just to solve level 1. The tricky part is when you have half of the numbers in the correct order and you need to reorder the other half. You'll have to think your moves ahead, or you might end up scrambling the already correct placed digits. I've had the puzzle for a few days now, but I still don't have a very good strategy to solve the puzzle. I'll only try the other levels when I feel confident I can solve level 1 without any problems, but so far I'm liking it very much. 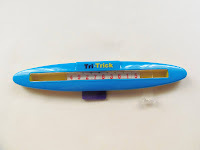 The Tri-Trick was a very pleasant surprise. The design is colorful and practical, and it definitely provides a good level of challenge. There are similar concepts around, but this one is different enough that's worth a try. 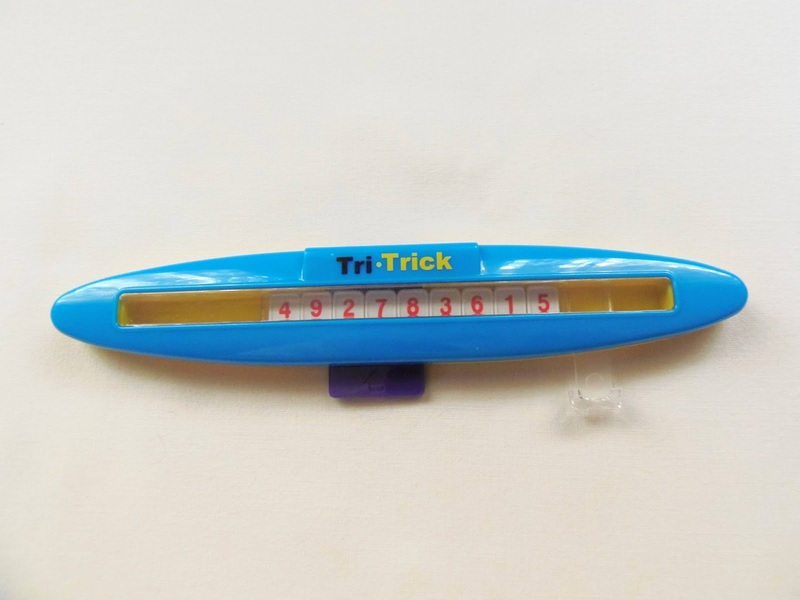 Availability: You can purchase the Tri-Trick directly from Hidden One Design's website for $10 USD. You can also download the Tri-Trick app for just $1 USD. 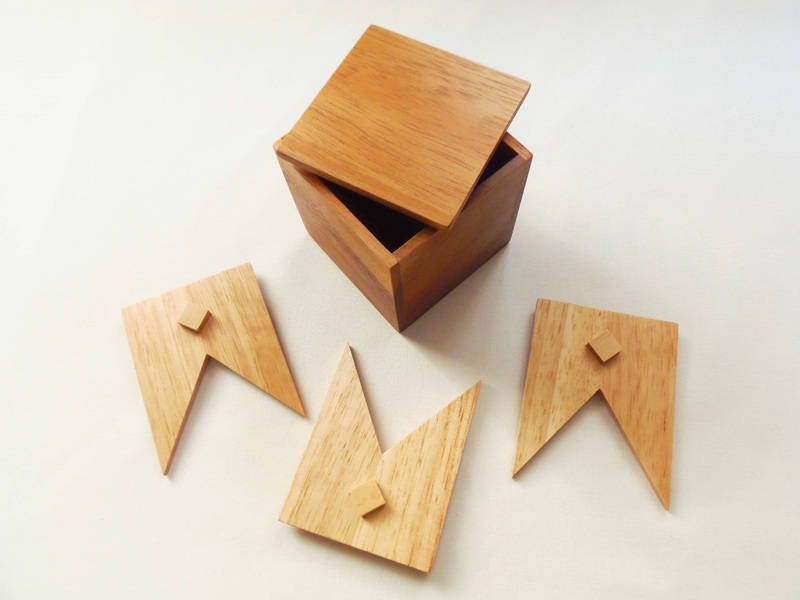 Hirokazu Iwasawa is a regular participant at the annual IPP since 2004 and is known for his superb designs, some of which have won awards, like last year's Puzzlers' Award winner, the Square in the Bag. The puzzle I'm reviewing today is not from the IPP competition, but it's definitely worthy of the same recognition. The 3M Puzzle, as the name suggests, consists of three M-shaped pieces that need to be packed inside the box. It sounds easy enough. It's just three pieces, right? - Well, these three pieces are all you need to test your patience, since the solution is very unusual. 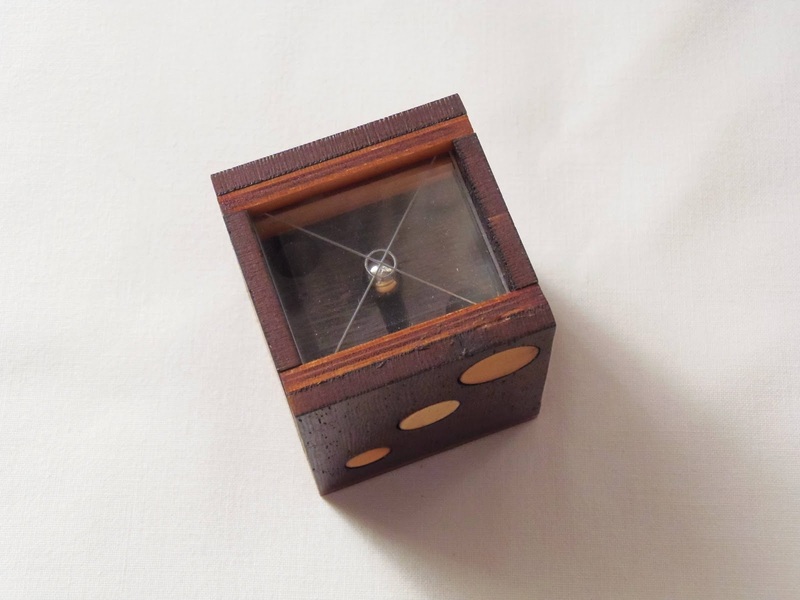 The puzzle, which is produced by Philos, comes in a nice small wooden box, with measurements of 6.8 x 6.8 x 7.2cm (2.7" x 2.7" x 2.8"). Be careful though, because the puzzle is packaged in its solved state. My advice, if you want to avoid spoilers, is to ask someone to remove the pieces from the box for you, or turn the box upside down and scramble the pieces with your eyes closed. I understand they need to save packaging space, but these type of puzzles should be packaged in another way. Part of the fun with puzzles is to solve them on your own. There's no worse feeling than to unpack a puzzle and see the solution shoved right in front of your eyes. It's happened to me before. When you have all three pieces out of the box the fun starts. How do you get them inside again? This is actually a very hard puzzle, and judging from PuzzleMaster's rating of 9/10 it's somewhat intimidating. The packaging also shows a level of difficulty, a little different from PuzzleMaster's, with a level of 3/4. Knowing what I was up against with, I proceeded with caution. The pieces are all identical, so no need for a particular sequence. Each pieces has a small square glued on both sides, which is going to block many of your moves. I started by trying to pack just two of the pieces to see how they interacted and which positions were possible within the box's edges. After some experimentation, and only a few minutes, I ended up with an interesting arrangement. Now, all I had to figure out was how to add the third piece to the already complex arrangement. It wasn't that hard, actually, although it required some dexterity and good hand coordination. The small squares are certainly a pain to deal with, and to place all three pieces you need to arrange them partially outside the box. I can describe the solving process as some sort of a Coordinate-Motion puzzle, where all pieces need to be assembled simultaneously in place. After solving it, I think the level 9 is maybe a bit too much. I consider it more an 8/10, although it's highly dependable on your skill with packing puzzles. Solution: PuzzleMaster doesn't provide a solution for this puzzle, but if you need help solving it you can check out a photo of its solution here. I really liked the design of the 3M Puzzle. It's simple and yet can be rather challenging. It's not a good puzzle for solving over and over again, because once you know the solution it's hard to forget about it, but since it's quite affordable it's a nice addition to any collection. Availability: You can find the 3M Puzzle at PuzzleMaster for just $16 CAD. You might know Nob Yoshigahara for his many design contributions over the years to the Cast Puzzle series. However, one of his most successful designs to date, the Rush Hour, is not a Cast Puzzle, nor the game I'm reviewing today, the Subtrax, but they're equally fascinating... And addicting, I might add. Even though the concept is not entirely new, since it's a variation of the classic Peg Solitaire, the new design is very attractive and comes with plenty of different challenges to solve - 40, to be exact. 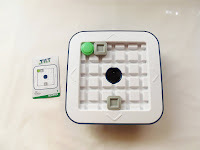 The game is produced by ThinkFun, so you can expect a high-quality product. 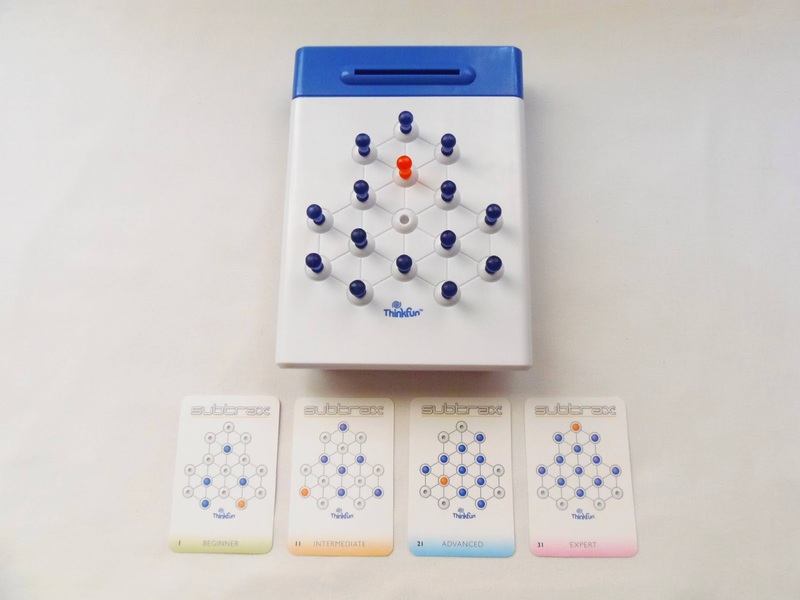 One of the reasons I liked the Subtrax instantly was its color combination, blue, white and orange. You can see why, by the colors in my blog. Also, because I always enjoyed Peg Solitaire games. I have a few variations in my ever-growing collection. The design is both elegant and very functional, like most ThinkFun games and puzzles, ideal for travel. The contents are stored in a sliding compartment and there's a slot in the top to place the challenge card being used at that moment. The dimensions are quite appropriate for this kind of portable game, with 18 x 13 x 3.5cm (7.1" x 5.1" x 1.4"). If you ever played a Peg Solitaire game before, the rules are basically the same: the pegs move from hole to hole following the lines on the grid; you can only move one peg by jumping over an adjacent one and remove it; in the Subtrax, the orange peg is the last one on the grid. No, because there's always that sense of dejá vù, that you played this before: you're jumping over pegs until only one remains. And yes, because in addition to the more traditional challenge, you're given a plethora of different challenges to solve in four different levels of difficulty. The new design with diagonal lines is also very interesting, and while not changing radically the concept, it does provide a new experience to an already known game... And I think I've already mentioned the superb color combo - That's a major plus! If you like Peg Solitaire games, I guarantee you you'll love this new approach to the concept. The challenges start rather easy with very few pegs to remove and will gradually become harder until all pegs are used. 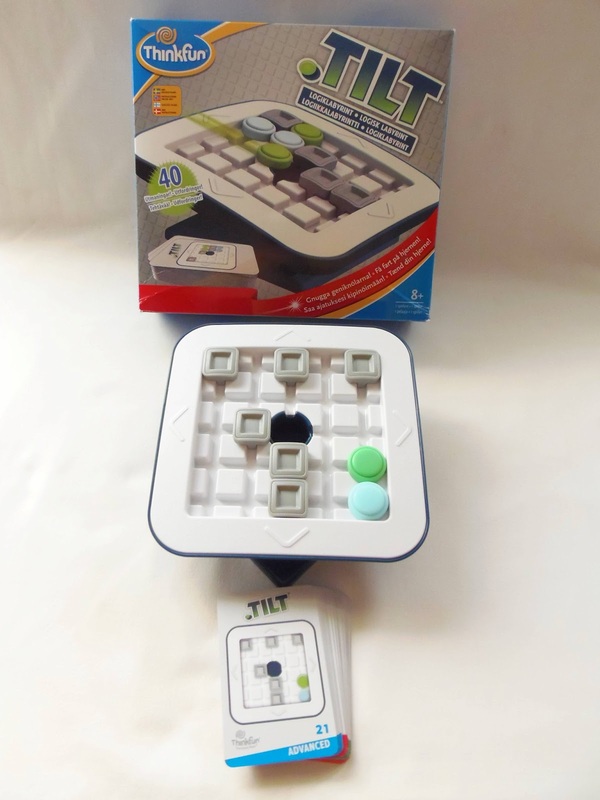 It's made by ThinkFun, so you won't be disappointed. Availability: I got my copy of Subtrax from Sloyd in Finland. International shipping available. Usually, I don't go for Burrs very often, not because I don't like this type of puzzle, but because they can really put my patience to the test. Some of them are great works of art made by extremely talented craftsmen, and the Satellite is a good example of this. Also known as Knobbly Burr, the puzzle was designed by Dic Sonneveld way back in 1975. Several different versions were made of it and the one I have is available from the folks over at Brilliant Puzzles. The Satellite is not your typical Burr puzzle, with notched sticks. The six pieces are interlocked by a series of sequential movements, similar to the solving process of the more traditional Burr, but instead it uses an alternate interlocking mechanism. The result is rather interesting, providing a whole different experience. The striking design of the puzzle is what really drew my attention in the first place. The intricate pattern of each of the six faces is stunning, with a mix of straight and curved lines, creating a beautiful symmetry seldom seem in puzzle design. The puzzle is also unusually large, with a diameter of 14cm (5.5"), but still comfortable enough to manipulate. The Satellite has a rating level of 4/5, which is challenging, but not crazy difficult like other Burrs. As with most Burr puzzles I've tried so far, taking them apart is usually easier than it is to reassemble them. Much to my surprise, both disassembling and reassembling were easier than I expected. I took about 10 minutes to do solve both challenges, although reassembling was slightly trickier, as I was unsure which sequence of pieces I should've followed. Dexterity certainly plays a major part in the reassembling, because the puzzle seems to conspire against you and doesn't want to be solved, falling apart at any given opportunity. The trick for an easier assembly is to connect the pieces in two groups of three pieces and finally join them in a two-move sequence. Availability: The Satellite is available at Brilliant Puzzles for about $28 USD. What does a mechanical puzzle blogger do exactly? - Why, write about mechanical puzzles, of course! Well, that was until blogger Jerry Loo came and made us bloggers feel kind of lazy for just write about other people's puzzles. He went out of his way and created an amazing puzzle. There were some hurdles he had to overcome as a first-time puzzle designer, but with perseverance and determination he did one hell of a job. The end result of his hard work is the Ball in Cylinder No.1, or BIC 1 for short, which technically is his second design. When I was contacted by Jerry a while ago, offering me one, I didn't think twice. Finally, I had the opportunity to see for myself what these cylinders were actually about, and if they deserved such high praise. Honestly, I didn't know what to expect, since it would be the first time I would try one of these, but I was surely very eager and curious about it. Jerry used aluminum as the source material for the BIC and the result is a clean polished look. 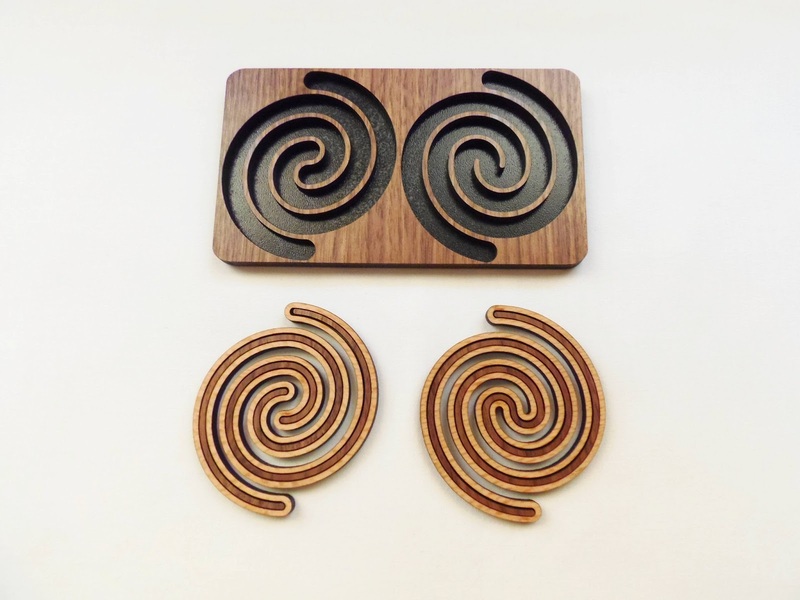 The design is sleek and stylish, and for the untrained eye it doesn't resemble anything you might take for a mechanical puzzle - That's a compliment. The size is relatively small, only 7.5cm in height and 4.4cm in diameter (3" x 1.7"). The BIC, even for certain puzzlers like me, is hard to explain or classify. I had seen similar designs before featured on fellow bloggers' write-ups, but until this one I had no previous experience with this type of puzzles. 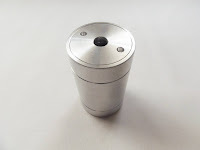 From what I know, Wil Strijbos is a master when it comes to Cylinder puzzles, but what kept me from getting one is their somewhat high price - You know how I feel when it comes to expensive puzzles - which is understandable given how difficult they are to manufacture. Belonging to the family of sequential movement puzzles, the BIC is much more than your average puzzle. At first, you might feel a bit lost as to what exactly you need to do in order to solve it. I was too, but after the initial puzzlement and with a bit of careful examination you start to see some rather curious features. The goal is simple enough to understand, although the solving process is anything but... All you have to do is free the hidden ball bearing inside, not the one you can actually see at the end of the central slit. That one is impossible to remove and it's there just make things harder for you. The tricky part about solving the puzzle, the part that took me quite a while to figure out, is finding a way to free the other ball bearing by bypassing the slightly larger one. 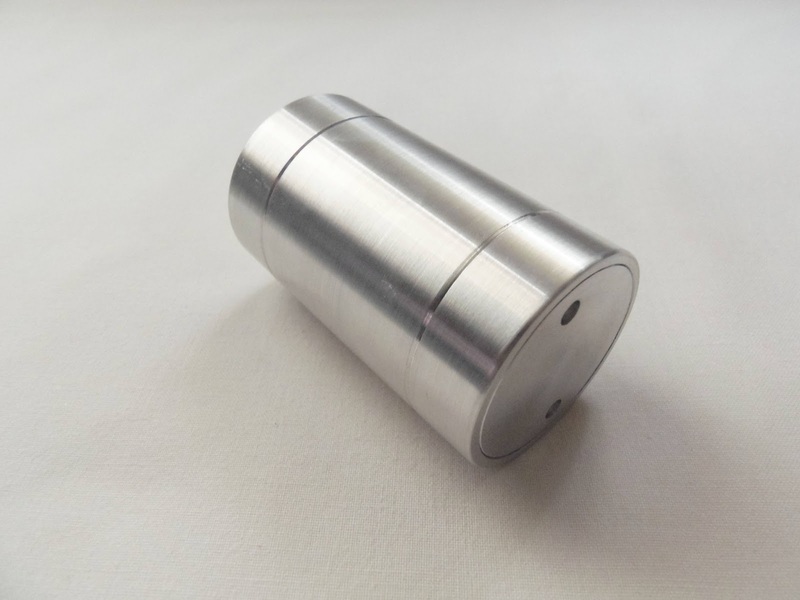 You will rely heavily on you hearing to have a clue on what's going on inside the cylinder. 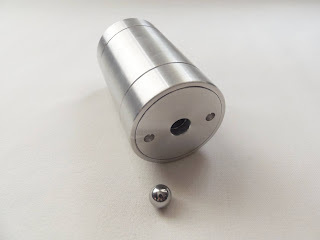 After some tries, you'll notice the hidden ball bearing behaves differently depending on its location. Knowing how the larger sphere moves, you have to worry about getting the hidden one out ahead of it. The exact steps to solve the BIC are best be left for you to discover for yourself. I was positively surprised by Jerry's attempt at puzzle design. And quite a successful attempt, I must say. His first BIC turned out pretty good and I can only foresee great things from here on out. I already know the production of the BIC 2 is well underway, so I can hardly wait to try it. Availability: To get a copy of the Ball in Cylinder No.1 contact Jerry directly at his personal e-mail. You can find it here. At £26.50, the BIC is very affordable for a puzzle of this nature. I highly recommend it. 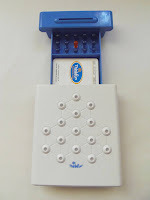 The Sequencer is the fourth puzzle I'm reviewing from the Paradigm Puzzles collection by Family Games America. 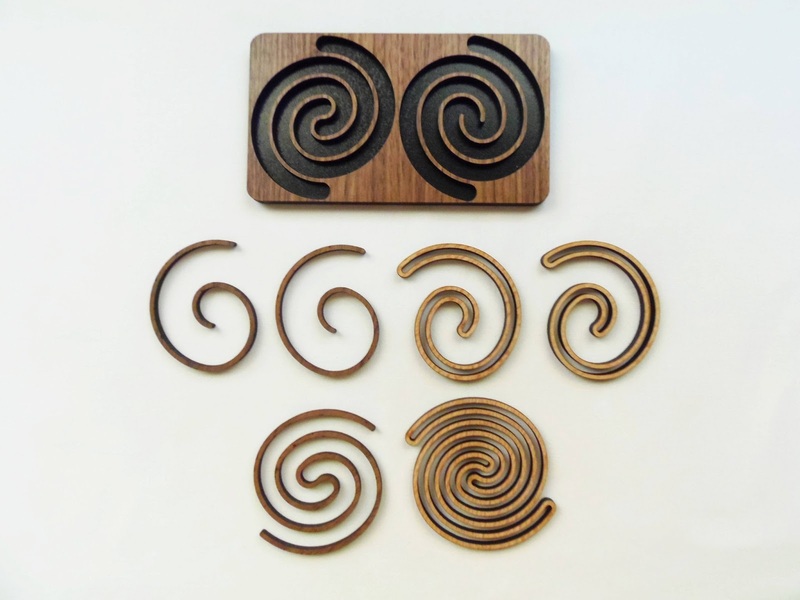 This series of six Packing Puzzles are all designed by William Waite, and feature some of the most mesmerizing patterns you'll ever see in mechanical puzzles. 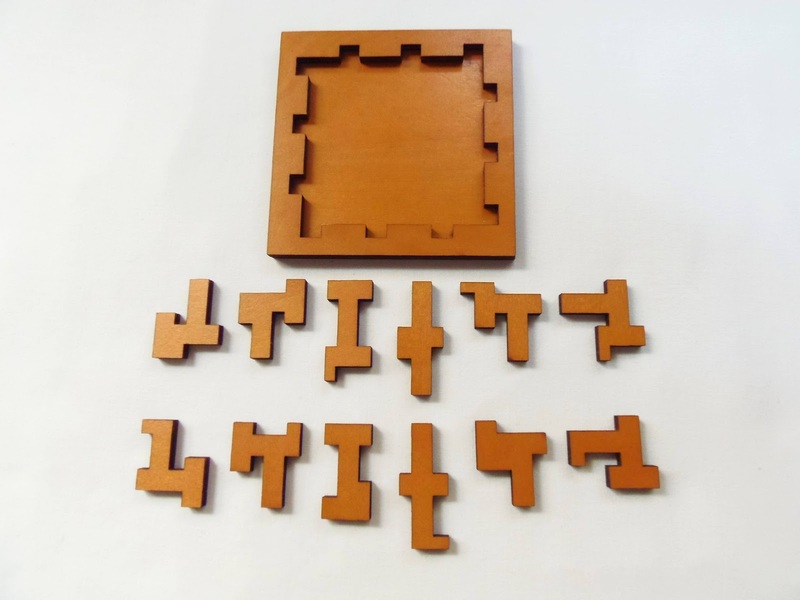 Like all the puzzles in the series, the Sequencer is laser-cut, made from plywood, so all pieces can fit perfectly in the frame. Not the best of qualities for a puzzle, but the result is still nice and makes it very affordable. The size is about the same as the others, with a diameter of 10cm (3.9"). While not as visually elegant as the previous three (Celtic Knot, Interlace Square and Interlace Diamond), the striking symmetry of the overall pattern in the Sequencer is still quite impressive. 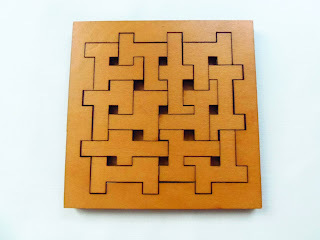 When solved, the twelve dissimilar pieces will form a pattern showing thirteen holes, so keep in mind the area will not be completely occupied. Also noticeable is that four of the thirteen holes located in the center are slightly bigger than the rest. The pieces, unlike the previous puzzles in the Paradigm series, are double-sided, so you can place them on which side you think it's best. As far as difficulty goes, this one's the easiest from all six. And judging by the rated difficulties of the others (I still have two left to try), it should be a walk in the park to solve with a level 4/10 (6/10 by PuzzleMaster's rating system, which only goes from 5 to 10). After solving it within 5 minutes, I have to agree with this level. 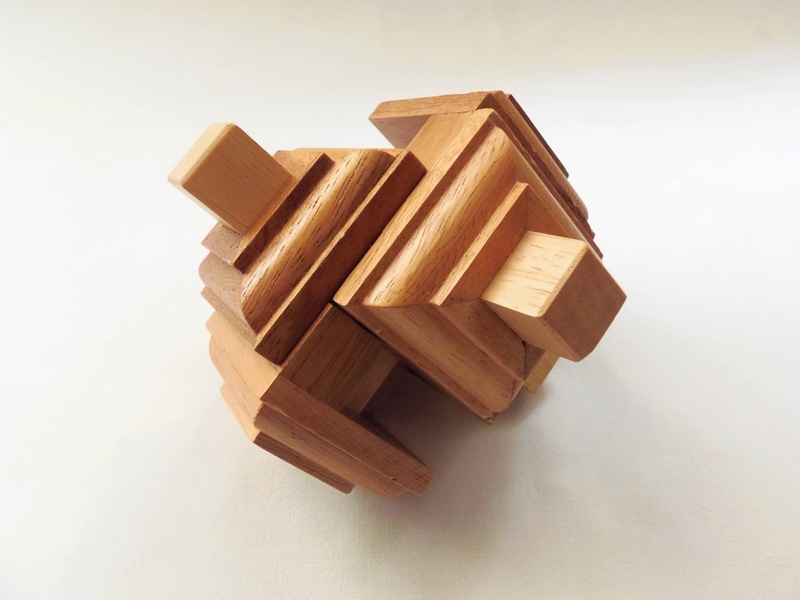 Although at first sight the puzzle appears to be a little complex, the main reason why it's easy to solve is because of its multiple solutions. With so many different arrangements, and with double-sided pieces, there's not really much to keep you challenged for long. Still, the Sequencer is quite enjoyable to solve and you can always try other solutions for a different experience every time. I recommend this one for beginners or if you're looking to complete the series of six. 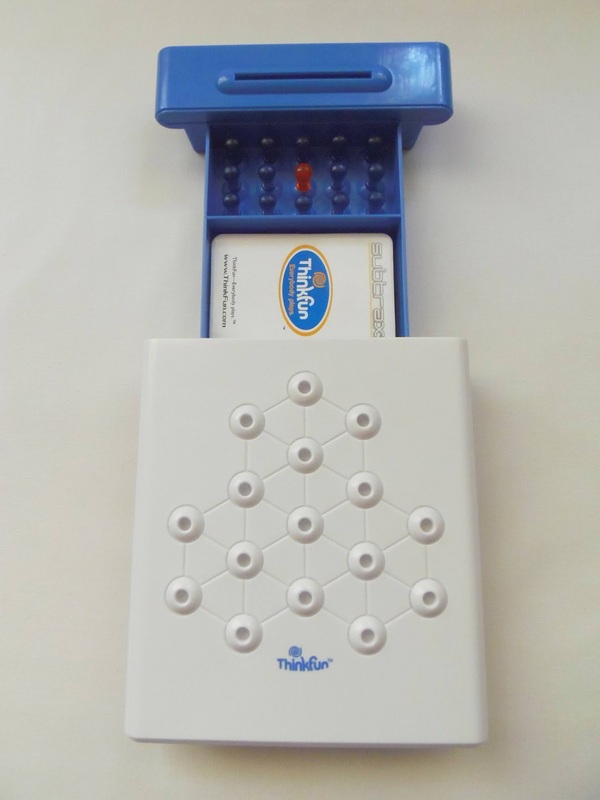 Availability: You can purchase the Sequencer at PuzzleMaster, as well as the other five in the Paradigm Puzzles Series.